Average Height	: 24" - 29"
Average Weight	: 40 - 63 lbs. This SightHound, used in the deserts to hunt wild game ~ rabbits, gazelles, foxes, jackals and sometimes pairing up with falcons. Also known to protect the home and livestock of it' master. The origin of the Sloughi is not known, but it is a very old breed. It was mentioned in a book by the Moroccan writer Al Mansur which was probably written in the 13th century. Morocco holds the FCI standard, but the breed originated in the area which today consists of Morocco, Libya, Tunisia and Algeria, in the northern Saharan region of the Maghreb. The breed is locally known as the Sloughi Moghrebi, meaning the "sighthound of the Maghreb." The Sloughis held an elevated position in comparison to other dogs, and they were greatly prized. Only chiefs and kings were allowed to own them, and much effort went into making sure that they were bred pure. An owner of a fine hunting female would travel far to find just the right mate for her. There were originally two types of Sloughi: the larger, more substantial mountain Sloughi and the smaller, lither desert Sloughi. In western countries there is less distinction between the two as they have been mixed. The breed is not, as previously believed, closely related to the Saluki. DNA testing has shown that these two breeds are only remotely related. The Sloughi's closest relative is the Azawakh, which belongs to the Berber tribes of southern Sahara. Still, the two breeds have been separated long enough that there are obvious differences in conformity and temperament. •	Affectionate, gentle and bond closely to their owners. •	Intelligent, independent and curious. •	Quiet and calm indoors and prefer to lie on soft rugs and blankets. •	Aloof & cautious with strangers, but enthusiastically greet friends. •	Get along well with children and other pets [if raised with them]. •	Not good with smaller animals, other smaller dogs ~ outside, since they hunt prey. •	Tend to be a very healthy breed. •	Need lots of running exercise. Excellent for joggers. •	Because they are runners never let them loose in unsafe areas. •	Easy keep for grooming. •	As a desert dog ~ need protection from cold & wet weather. The Sloughi is a medium-sized, short-coated hunting sighthound of the desert type. 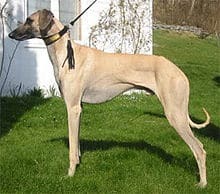 An African sighthound, it was used to hunt wild game, such as desert hare, gazelles, foxes and jackals, often in cooperation with hunting falcons. It also protected the house and livestock of its owner. The breed is adapted to desert and semi-desert life in the Maghreb region of northwest Africa. This dry, lean and muscular hound gives an impression of rustic elegance as well as strength, and it is an efficient hunter with great endurance as well as speed. Sloughis are gentle, affectionate and very closely knit to their owners. They are intelligent and independent, and curious of their surroundings. Sloughis are quiet and calm indoors, and prefer to lie on soft rugs and blankets, often on their backs with their legs in the air and the neck twisted at a seemingly physically impossible angle. Strangers are met with aloofness and caution, while friends are greeted with enthusiasm. Sloughis don't make great obedience dogs, but they respond to fair and gentle training methods. Sloughis get along well with children and other animals if they are raised with them. Sloughis are hunting hounds with a strong chase instinct, but caution is recommended when the dog is outside with smaller animals. Any small, running animal may trigger the dog's hunting instinct. Sloughis, and particularly young dogs, like to run daily. They make excellent jogging partners, and need to go on daily walks or runs. They will truly be happy when they are allowed to run off leash. Because of Sloughi's hunting instincts, they should never be let loose in unsafe areas. A normal fence will not stop a Sloughi chasing a squirrel onto a street in front of a fire truck with sirens blasting! Many Sloughis are lost in traffic accidents each year. But a Sloughi that is allowed to run off leash a few times a week will spend most of its time indoors resting in a comfortable spot where it can watch its humans with half an eye while drowsing. Sloughis do not like to be separated from their flock, and this is an advantage when they are let loose outdoors. They may chase every squirrel and bird within sight, but they will always return to their humans. The Sloughi's coat is short with no undercoat, and it has no "doggy odor" unless it's wet. Dirt and mud falls off by itself when the fur dries. Because it is a desert hound, the Sloughi needs protection in cold and wet weather. Grooming is easy; a rubber brush or grooming glove will remove dead hairs. The Sloughi is an average shedder. Several people have reported that Sloughis are good for people with mild cases of dog allergy.